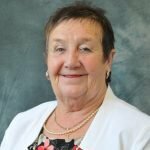 It is a privilege to represent the people of Fulwell on Sunderland City Council and one that Margaret has taken seriously as a councillor for the area. During her years of community work, Margaret has made many contacts in groups and organisations throughout the ward and she is proud of the investment she has been able to attract. She has managed to keep the Community Library open, gain funding from the council to improve the Community Centre, and coordinate a successful residents’ petition to deliver the parking scheme around the Metro and Hospital. If re-elected, Margaret will do even more, and give Fulwell the representation in council that it deserves.